The Ikea store opened near us about two years ago. I finally went to Ikea about two months ago for the first time. In general I will stay away from big huge-o-mongous stores because they tend to overwhelm me. I like smaller stores, like the "old" Wal-Marts. You remember them, the nice small stores that were normal, and were not the size of Airplane hangers? Yea, the Super Wal-Marts kinda freak me out too. So, when Ikea did hit town, they sent out catalogs to just about everyone and their brother. I looked at that catalog for months. I studied each page and was fascinated by all of the items that they could shove in that little catalog, and then cringing at the thought of actually having to go into the store... so I would take comfort in the catalog and be happy with that. One day while browsing through the Ikea catalog, I stumbled upon a fancy-dancy clothes drying rack. I thought that this little clothes drying rack would really work well for me. I do have an outside clothesline, but the Florida weather during the summer is not always sunny, and it is just plain freaking hot if you must know. So I eye ball this cute clothes drying rack for several months, ( you see I really want to avoid the crowds at Ikea) and I even check online to see if I can order it. 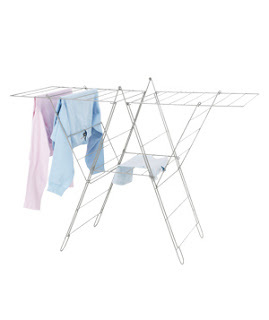 By the way, this drying rack has 20 yards of drying line, Isn't that just wonderful?? I am in heaven! Back to the story.....Oh Nooooo..... I cannot order it online, I have to go to the store to get it. Crap. Hubs and I go one evening about 3 months ago. And when I say evening, I mean about 8pm. We get there, and the parking lot is pretty quiet and not crowded at all. And why is that you ask? Well Ikea closes at 8pm on Friday night!! Are you serious?? Well, I had to go back when it was open. I checked the hours and was aware of when they were open and planned accordingly. We went back to Ikea on Labor Day. Oh yeah... A Monday and a Holiday. Talk about being overwhelmed!!! After parking out in the back forty of the lot, we walked in and I immediately asked for directions on how to find the clothes drying rack of my dreams. The lady quickly pointed out on the store map where I needed to go, and hubs and I quickly and with focus used the map to locate the drying rack. We had to go upstairs to go back downstairs to weave our way back into the bowels of the Ikea Store.... And yes it was freaking crowded. Note to self, no more shopping at Ikea on Federal holidays. So, I or we managed to find the rack, and I grabbed it, put it in the cart, which by the way is not that easy to steer. We map quested our way back out of the store and found the registers. You are definitely a captive audience when you go to Ikea, no doubt about it! After paying for the drying rack, which was 19.00 before tax, we hiked back out to the back forty of the parking lot, loaded the car and headed back home. I use the rack daily. It is in the spare room out of the way and I enjoy it to no end. Thrifty and Fun. Who could ask for anything more? How cool - wonder if my ikea has those ... I love it! I bet they do! You will love it!